On September 9, the usual tranquillity of Sunday evenings in Discovery Bay was disrupted by thousands of residents participating in a demonstration, against the impending eviction of Discovery Bay Marina Club houseboat residents.The move is due to new plans initiated at Tai Pak Bay by the Hong Kong Resort (HKR), a company which owns most of the development projects in the area. All dressed in white shirts, the demonstrators marched from Marina Club on to Discovery Drive and up Sienna Road. They gathered at the centre of the North Plaza at around 6pm, right before the commencement of their community hall meeting. 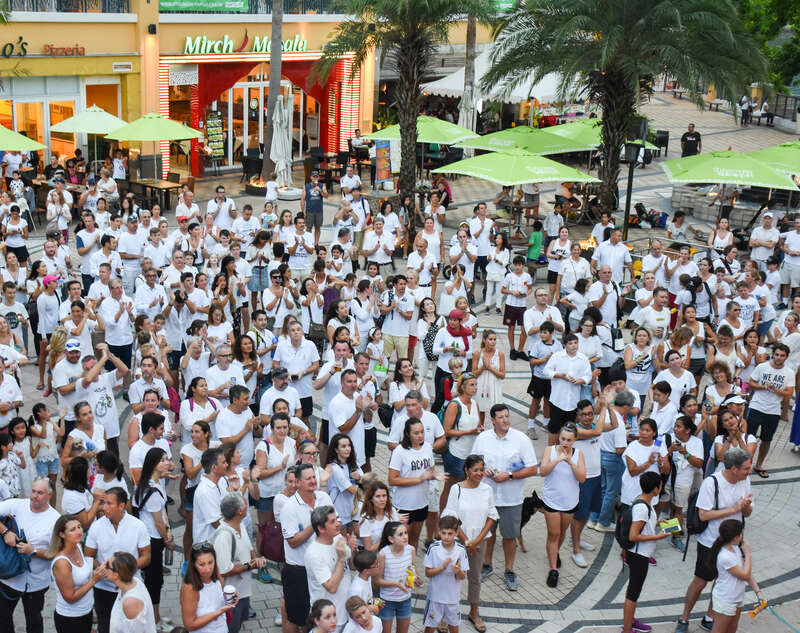 Thousands march from the Marina Club to the North Plaza in protest against the Hong Kong Resort’s decision to evict boathouse residents, a decision that they believe would negatively impact the entire Discovery Bay community. 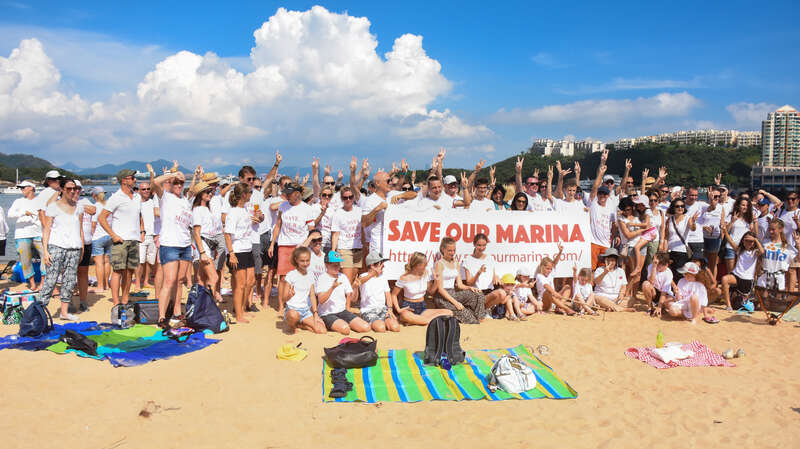 "We want the Hong Kong Resorts to understand that their actions don't just affect the Marina residents, but also this entire community," said Henry Moreno, one of the organisers of the demonstration, who is also the chairman of 208 affected boathouse members. Mr. Moreno moved to Marina Club with his wife and three children just two years ago because they could not afford an apartment in Hong Kong. His boat costed him around $4.4 million, of which he still has a $3 million mortgage yet to be paid. However, once evicted with nowhere to berth, his vessel will worth nothing. "I am close to facing personal bankruptcy," said Mr. Moreno, "I still have three kids that go to school here, two in Discovery Bay International School which is owned by Hong Kong Resort and one in Discovery College, who would be out of school if we can't make things work. I have a family to take care of, so leaving the marina with nowhere to go is definitely not an option. But right now I really don’t know where we can go." On September 23rd, hundreds of Discovery Bay residents, including those who live in the Marina Club, gathers on the Tai Pak Beach beach with their banner. Discovery College and Discovery Bay International School are the two main schools in the area. In Discovery College, 27 students from 21 families would be directly affected, excluding staff members. Around 90 out of the 220 boathouse families send children to schools in Discovery Bay. Mark Beach, Principal of Discovery College, has mentioned in an email to staff members that they need to be watchful of signs such as depression and dropping grades not only among the directly affected students, but also their friends and classmates. "My eldest daughter Emily goes to Discovery College and is already in her diploma year," said Liz Hemmings who lives in the marina, "Both my daughters grew up here, go to school here, and have so many friends here. It will be heartbreaking for them to be apart from each other." Children from these boathouse family might have to change schools and risk losing their study opportunities if their parents cannot make alternative living arrangements in the area or if their families become bankrupt. Ms. Hemmings feels that it is important to acknowledge the fact that people in the boathouse community are not some billionaires who are about to lose their "fancy pleasure yachts". Many families are on mortgage while others have spent their life's savings on the boathouse. This would be an economic catastrophe for all of them. "If anyone thinks that this just affects us, then they are wrong," said Ms. Hemmings, "There are some very vulnerable people, such as our helpers and boat boys, who would be out of a job. Once we leave, they would have to go back to their own countries, and it would be very difficult for them to come back here." Diana and Nicklaus Von Der Luhe are residents of the Marina Club who also believe that this would be a huge blow on the entire community, the community which their daughter, who suffers from disabilities,has strongly relied on. "Everyone here knows our daughter Catherine," says Mrs. Von Der Luhe, "They helped her find a job and really took care of her. Sometimes she can have seizures when she is outside, and without this community that we know would help her, it would be very terrifying and potentially dangerous." Even though all residents of the marina are aware that December 31 will be the expiry date of their debentures as stated in their contract, the eviction notice still came as a huge shock to them for many reasons. Ms. Hemmings explains that all of them were expecting a new form of contract or a renewal of debenture, because the Marina Club has just raised their berthing prices in May and have hired new staff for the club house during summer. "We have been continuously asking the HKR since a long time ago what they are planning to do when our debenture ends. The answer we always got was 'we will let you know soon'. A while ago, the HKR suddenly started to voluntarily sponsor the DC Parent Association along with multiple other sports clubs, so we all thought things are improving. Until suddenly, the eviction notice drops. We don’t know how we are suppose to interpret this chain of events," said Ms. Hemmings. What frustrated the residents even more is that they feel like they are being ignored by HKR. 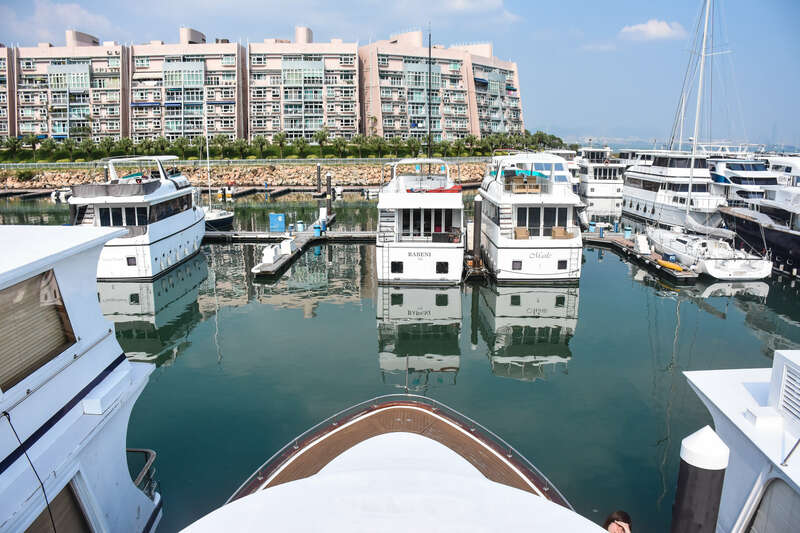 According to Ms. Hemmings, the Chow family which owns the HKR have berthed their gigantic yacht "Zeepaard" right next to the residents' boathouses and threw a party there a week after the eviction notice. "The marina situation is an injustice really, because many of these people have contributed so much to our community," said Talek Harris, a resident of Discovery Bay and attendee of the demonstration, "Maybe the legality of it is that HKR can throw these people out of their homes, but in a moral sense, this is very reprehensible." Another Discovery Bay resident, Jenny Jones, also believes that even though it is the HKR’s business to make money,the eviction destroys the trust between them and the entire community which will harm their long term interest. "They will also make more money if they act responsibly so that people feel DB is a positive place to live and worth investing in. Who will want to buy property here if they know HKR can change plans on a whim without consulting them, and destroy their life’s savings overnight?" said Ms. Jones. However, according to Eliza Xue, a lecturer from Hong Kong Baptist University on Law for Hong Kong Business, it will be difficult to contest HKR’s decision based on legal grounds. "The HKR is not blameworthy at law since what they are doing is safeguarded by their contract, which is 4 months' notice in advance and a notice made on August 31 is just in the right time," said Ms. Xue, "We are not able to make the faintest guess why the HKR chose to keep its plan in the dark, but it seems that it is entitled to do so if it chooses to. It appears to be a pure commercial decision which is beyond the reach of unjustified challenge." Nevertheless, it is in Ms. Xue's opinion that, if by any means, the Marina residents obtain misleading messages made by it or its staff, such as any official representation that the contract would be renewed or any signal substantial enough to make the residents believe that they will not be evicted, the HKR could be stopped by the intervention of Doctrine of Estoppel. This Doctrine prevents one party from withdrawing a promise made to a second party if the latter has reasonably relied on that promise. 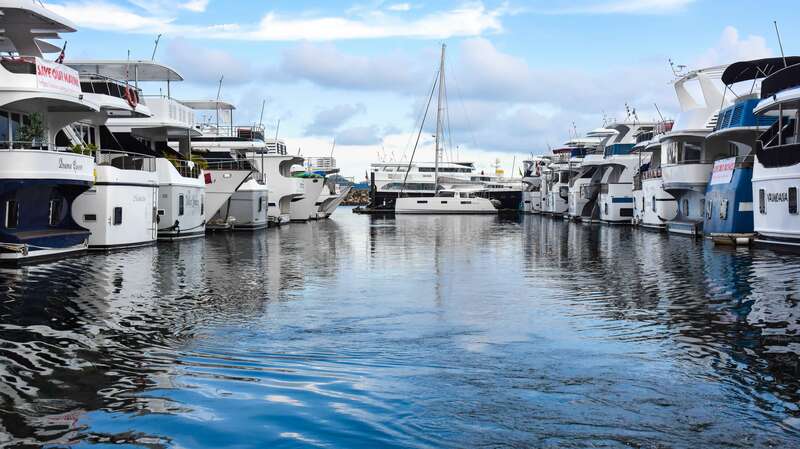 In response to this situation, the Discovery Bay Marina Club (DBMC) stated that it is simply "exercising its contractual rights to redeem the debentures when they become repayable on 31 December 2018". "After 29 years of non-stop operation, it is in need for a long overdue renovation and upgrade of its facilities to provide safe anchorage and high-quality marina services for our members," said Jenny Zhang, DBMC’s media spokesperson, "The Club will reopen with a brand-new design, modern technology and more berths to meet the needs of Hong Kong’s growing sailing and pleasure boating community." Though it cannot offer any current solutions for the boat owners, DBMC clarified that there is no plan to reclaim the Marina for other purposes and specifically, there is no plan to land fill the Marina as part of the renovations. "The families are desperate to find a home," said Amy Yung, District Councillor of Discovery Bay who has been actively seeking a solution, "I have contacted the government department to align a meeting between them and the leaders of these Marina Club residents, so that the residents can express their will and explore different options with help." 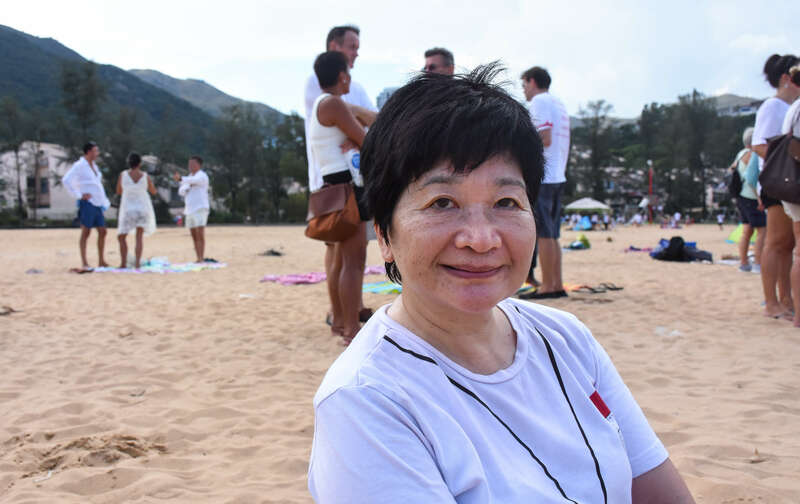 District Councillor Amy Yung joins the gathering on the beach in support of the Marina Club residents. According to Ms. Yung, she has made both long term and short term plans. In the long run, there is a marina in the northern part of Lantau Island, so that is a possibility to be discussed with the government. In the short run, she will help identify different locations to house these boats. "This entire community will work together and do whatever we can to help," Yung concluded with determination, "We will not let our friends and neighbours suffer alone."